Hi! Welcome to my humble home on the net! Here are some more cute pics. 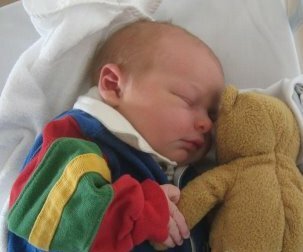 I was born 15:25 on March 19, 2008 at Danderyds Sjukhus near Stockholm. 53cm and 4.005 kg - yep, I'm bigger than my siblings Jenny and Dave were! Thanks to y'all who sent us name suggestions!